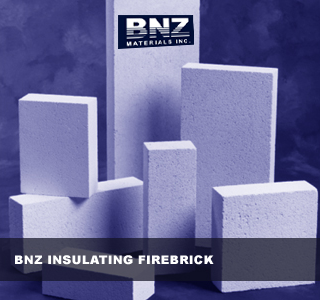 BNZ produces thirteen types of Insulating FireBrick (IFB) for use in applications from 2,000°F (1,093°C) to 3,200°F (1,760°C). Each type is formulated to meet specific thermal and physical requirements and after firing is machined to precise tolerances. BNZ-20 has the low density to meet the criterion for ASTM Grade 20. Its low reheat shrinkage meets the ASTM Grade 23 criterion. BNZ-23 is the traditional 2300° IFB manufactured by BNZ. It has a history for excellent service in suspended arch designs under cycling conditions. BNZ-23 HS is a high strength ASTM 23 Grade for applications where a stronger brick than the traditional 23 is required. BNZ-23 A is a slightly lower density, higher strength version of the BNZ 2300 IFB which can be used in any application where a lower density IFB may be needed. BNZ-26 is the standard ASTM Grade 26. BNZ-26-60 meets all requirements of an ASTM C 155 class 26 IFB, with a higher alumina content than the standard BNZ-26 IFB. This makes the BNZ- 26-60 specially designed for areas where furnace atmospheres require the chemical inertness of a higher alumina product. These include the exposed lining of ceramic kilns and special atmosphere furnaces. BNZ-28 is the traditional ASTM Grade 28. BNZ-32 is a reasonably priced alternative to bubble alumina brick in many high temperature applications or where high alumina content is required. The Zelie Jumbo sizes are especially useful as spanner brick over burner tile.